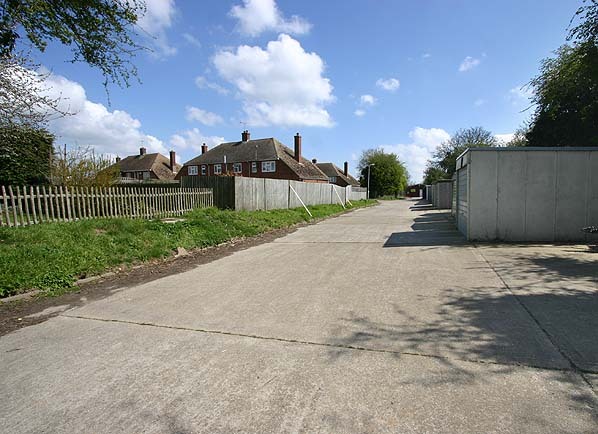 Present state: No evidence of the station remains, a service road to lock up garages occupies the site of the station which was in a shallow cutting; the cutting has been infilled. A scout huts sits on the course of the railway to the east of the station. Notes: The line was extended from Wingham Colliery to Wingham Town in 1920. The station had a 125' brick faced platform with a wooden building on the up side of the line and was in initially provided with a loop and a siding extending across Adisham Road. With the opening of the extension to Canterbury Road in 1925 the station was downgraded. The loop and siding were removed and the station building was moved to the new terminus and replaced by a wooden hut. From 1920 - 1925 the company carried passengers to Wingham Town without authorisation which is why the station doesn't appear in timetables until June 1925, the same date as Canterbury Road. bridge instead of the low-level swing bridge authorised. By the time the line reached Richborough the port was already in decline. terminated in an incomplete cutting on the north side of Canterbury Road. A passenger service from Eastry to Sandwich Road (a length of 2½ miles) on the Port Richborough branch started 13th April 1925; a station was built at Richborough Port but was never opened due to the condition of the bridge over the River Stour. Initially there were two daily return trips between Shepherdswell and Sandwich Road but by 1926 this was reduced to one daily train with two on Wednesday and Saturday. This service was short lived and was withdrawn on 31st October 1928 with closure of the halts at Poison Cross, Roman Road and Sandwich Road. of timber for pit-props at Tilmanstone Colliery and the export of some coal from Snowdown. the main line. The company was granted a light railway order in 1993 which allowed them to run passenger trains for the first time in 40 years between Shepherdswell and a new station that was later built at Eythorne. In 2003 the EKR became a Charitable Trust. The railway is open every Sunday between April - September and on certain other days during the year. To see other stations on the East Kent Light Railway click on the station name: Shepherdswell, Eythorne, Elvington, Knowlton, Eastry South, Eastry, Woodnesborough, Ash Town, Staple, Wingham Colliery, Wingham Canterbury Road, Poison Cross, Roman Road, Sandwich Road, Richborough Port & Tilmanstone Colliery Yard. 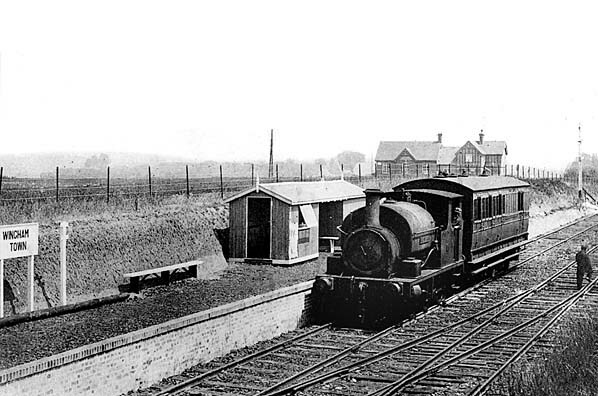 Wingham Town Station looking east in c.1925. At this time Wingham Town was the terminus of the line. 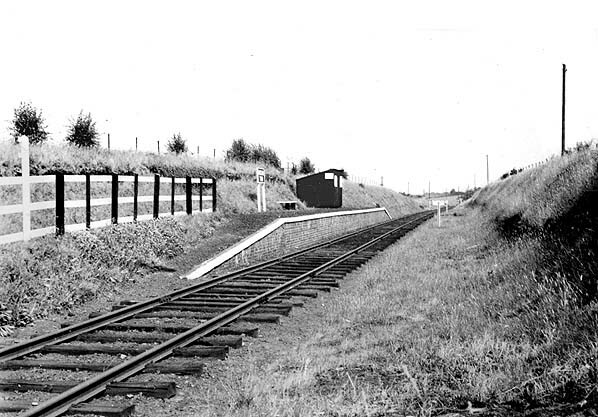 Wingham Town Station looking east after 1925. With the opening of the extension to Canterbury Road the loop and siding were removed and the station building was moved to the new terminus.